What happens when you go down south on I-55 a bit in search of the town of St. Mary and it’s huge Antique Mall? Well, if you leave St. Mary and head east with intentions to follow the river back north a bit to the town of Ste. Genevieve like we did today, you’ll come to a bridge that crosses a creek and takes you across the Illinois state line. Confused? Yeah, we were too. Where was the river? We thought you had to cross the Mississippi River to get into Illinois. Well, not here you don’t. It turns out that when the river flooded in 1881, the channel shifted east of Kaskaskia, Illinois, cutting off the town from the state. Kaskaskia was even an island at one time until the river continued flowing in its new channel and deposited earth into the old channel which caused the town to become connected to the west bank. Kaskaskia has a Missouri zip code but an Illinois area code, and today it is the hometown of only 14 residents thanks to the flood of 1993 which put the town under nine feet of water. Kaskaskia is the second smallest town only to Valley City which has 13 residents. So what is Kaskaskia known for? Well, it was the first state capital back in the early 1800s. And in the 1700s before that it was a major French colonial river regional center that provided lots of crops and supplies down the river to New Orleans. It’s also the place of the state’s first execution – a slave was burned at the stake for witchcraft! In 1741, King Louis XV sent a bell to Kaskaskia for its church. And guess what? This bell is still there! It’s older than the Liberty Bell and hangs in a small museum there. The museum was closed today but we got to see the bell through the window, called The Liberty Bell of the West. 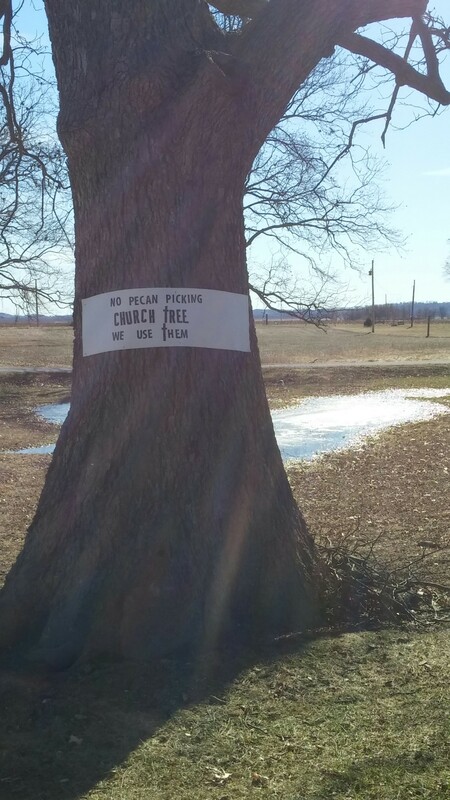 Leave it to me to find something even more interesting there though – this old pecan tree and the polite sign that let’s you know not to pick the pecans because the church uses them!